Camelina is a feedstock for biodiesel. Info on production and challenges; specific guides for US growing regions. Camelina (Camelina Sativa L. Crantz), sometimes called “false flax” is a member of the mustard (brassica) family. It contains 30 to 40% oil by weight. The oil is mostly unsaturated (90%) and is high in Omega-3 fatty acids making it useful in a healthy human diet. The remaining seed meal contains about 40% protein and has been considered for use in poultry and livestock diets, but glucosinolates can pose a problem. Camelina is a yellow flowered annual, short season crop (85-100 days) growing 1-3 ft. tall, producing very small (<1/16”) oval seeds in 1/4”-1/2” onion bulb-shaped pods. Camelina seeds are small (220,000 to 450,000 seeds/pound). A more detailed description can be found in the NRCS-USDA Plant Guide, which also contains a valuable list of other references on Camelina. Production of Camelina can be a fall planted winter annual in more southern states to an early-planted spring annual in the northern U.S. Although evaluated on the east coast and as far south as Florida, it appears to perform best as a spring annual in the Pacific Northwest and northern Rocky Mountain states. Because of its cold hardiness, it can be planted in very early spring by drilling or broadcasting 3-5 lbs/A PLS shallow (1/4”) into a firm seed bed. Several varieties are available, but they need to be selected relative to their adaptation and performance in the intended production area. Camelina plants with seed pods growing at Tennessee State University research farm. Photo: Jason de Koff, Tennessee State University. Camelina is resistant to blackleg (a disease common in Brassicas such as canola), has few insect problems, and competes well with weeds if grown at high densities (except for perennial weeds, which may be difficult to control). Because it is currently produced on limited acres and has not been evaluated extensively, few pesticides are labeled–should they be needed. Fertility requirements are similar to Rapeseed and Canola but at a more modest level. N needs appear to be about 5 lbs/100 lbs of expected yield. Harvest is similar to that of other oil mustards, but care must be taken because of the very small seed size. Camelina trials in Montana have reported reports yields of 400 to nearly 2,000 pounds/acre in dryland areas with 16 to 18 inches of precipitation. Idaho reports 1,700 to 2,200 pounds/acre in areas with 20 to 24 inches. Most other production areas have reported lower yields. More detailed production recommendations can be found in additional resources below. Although Camelina is generally less expensive to grow compared to other oil mustard crops, its generally lower productivity on poorer soils where it is preferentially adapted, results in low economic returns at current prices. No commercial commodity channels currently exist for marketing and utilization in the U.S. A comparative analysis of Camelina and other oil seeds for biodiesel potential can be obtained from Economics of Oilseed Crops and their Biodiesel Potential in Oregon’s Willamette Valley. NRCS-USDA Plant Guide – This USDA plant guide has information on camelina’s production, use, adaptation, description, management and cultivars. 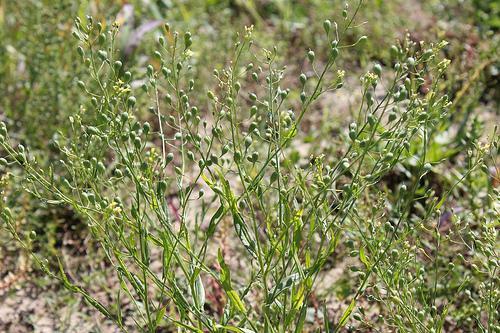 Camelina Production in Montana – Montana State University Extension’s publication includes: crop history, production, economics, current research, harvest, and storage information. Guide for Producing Dryland Camelina in Eastern Colorado – This camelina production guide from Colorado State University Extension has a dryland perspective; potential benefits and problems are included. Camelina Oregon State University Extension’s publication covers history, description, uses, adaption, cultural practices, harvest and yields. Camelina: Potential Oil Seed Rotation Crop for the Willamette Valley – This Oregon State University Extension web-article focuses on research to determine camelina’s planting time and method, fertilizer rates, and cultivars for use in the Willamette Valley. Camelina Production and Potential in Pennsylvania – Penn State University Extension’s guide includes history, description, adaption, variety selection, production information, yields performance, and use and economics. Economics of Oilseed Crops and their Biodiesel Potential in Oregon’s Willamette Valley – This Oregon State University Extension report included many oil seed crops including camelina. It focuses on feedstock production, oilseed content and extraction yields, crop enterprise budgets for oilseed production, oil extraction and biodiesel processing, and biodiesel economic.